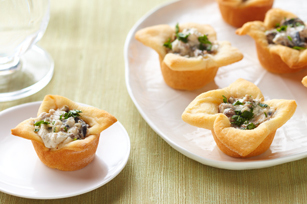 Fresh & light, a lovely spring appetizer! Melt your butter in a pan, add mushrooms, stirring for 5 minutes. Add cream cheese and Parmesan, stirring for 1 minute or until cheese are melted remove from heat and set aside. Unroll your dough, firmly press perforations and seams together to seal. Cut each rectangle into 12 squares. Place 1 square in each of 24 mini muffin cups (CUTE) with corners of squares just extending over rims of the cups. Firmly press dough onto bottom and up side of each cup. Cool a bit & eat!! !